Choose this product if your 6 Month GrowJourney Subscription will be SHIPPING TO CANADA. Yes, we can ship to Canada! However due to the higher cost of shipping to our northern friends, we are unable to offer free shipping to Canadian members at this time. We have added a $7/month shipping charge ($42/6 month period for the six month membership) to the base cost of the US membership ($80.94) to cover the additional USPS & Canadian shipping charges. Yes, we can ship to Canada! However due to the higher cost of shipping to our northern friends, we are unable to offer free shipping to Canadian members at this time. 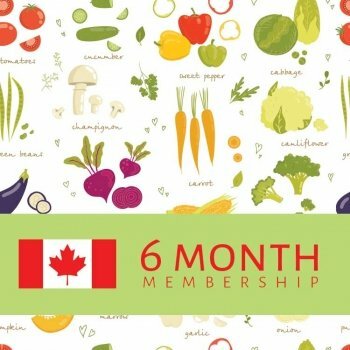 We have added a shipping charge ($7/month for the six month membership) to the base cost of the membership ($80.94) to cover the additional USPS charges. Five packets of USDA certified organic, heirloom gardening seeds (never the same seed variety twice in any 12 month period).